There is nearly $67 billion worth of bank stocks in Berkshire Hathaway's portfolio. As of the latest available information, Berkshire Hathaway's (NYSE:BRK-A) (NYSE:BRK-B) stock portfolio contains 44 companies' common stocks and has a market value of roughly $178 billion. Of this, about $66.9 billion, or more than 37% of the portfolio, is made up of banking stocks, many of which we know were selected by CEO Warren Buffett himself. This begs the question -- why does Warren Buffett seem to love the banking business so much? As of the latest available information, there are eight different bank stocks in Berkshire Hathaway's portfolio, with positions that range in size from $517 million to more than $25 billion. Data source: Berkshire Hathaway SEC Filings. Bank of America investment as per company press release. Some of Buffett's bank stocks have their own stories behind how they ended up in the portfolio. For example, Berkshire's massive Bank of America investment is the result of a savvy financial crisis-era investment that allowed Berkshire to purchase 700 million shares of the bank for less than one-third of their current market value. In other cases, Buffett simply loves to buy well-run businesses at fair prices. With that in mind, here's some color on how so many banks ended up in Berkshire Hathaway's stock portfolio. Simply put, banks have a lot of characteristics that Buffett is known to love. And thanks to government regulations, Berkshire Hathaway cannot simply acquire banks outright, so the company invests through bank stocks instead. For one thing, banking is a "forever" industry. People will always need safe places to put their money, and other companies will always need financial institutions to be able to conduct their own business. In short, Buffett likes picking the long-term winners in industries that will be around for centuries, and few industries are more durable than banking. In addition, banks receive cash from depositors for next to nothing and lend it out to creditworthy borrowers to make a profit. This is similar to the insurance business, another Buffett favorite, which provides low-cost capital through paid-in premiums, which the company can then invest at a profit. Another reason Buffett has accumulated so many bank stocks is because there have been plenty of opportunities to do so at a bargain, which Buffett has taken advantage of. I already mentioned the Bank of America investment, and the Goldman Sachs stake was also a product of the financial crisis. Another example is that Buffett initially purchased shares of American Express during a banking panic in the 1960s. Additionally, M&T Bank was purchased in the wake of the Savings and Loan Crisis in 1991. In Buffett's most recent letter to shareholders, he said, "widespread fear is your friend as an investor, because it serves up bargain purchases." This has been especially true in the banking industry over the years. Not all of Buffett's bank investments have been bargains. Some were just Buffett doing what he does best -- finding the best companies in a durable industry. The two biggest examples of this in Berkshire's portfolio are Wells Fargo and U.S. Bancorp, which are consistently among the most profitable and efficient big banks in America. Although, to be fair, Wells Fargo was purchased at a time when the bank's shares were trading at an incredibly low valuation. 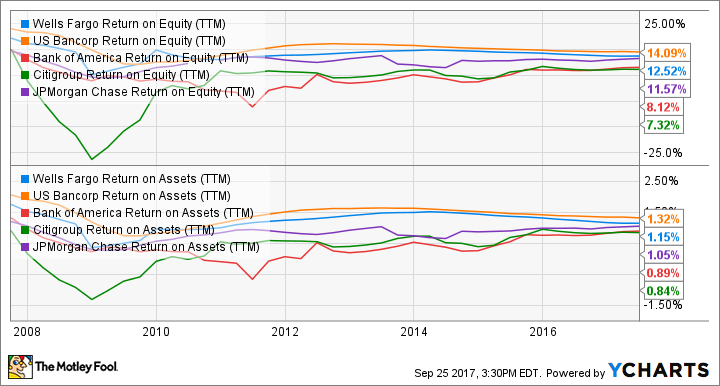 Take a look at the return on equity (ROE) and return on assets (ROA) of these two banks (the blue and yellow lines in the chart) compared to the rest of the five largest U.S. banks in recent years. This consistent performance is the key reason Buffett hasn't gotten rid of his Wells Fargo investment, even after the scandals plaguing the bank. Should you buy any of these? First off, I never suggest you buy any stock simply because a billionaire owns it, even if that billionaire is Warren Buffett. Additionally, it's fair to say that at the time Buffett bought most of his bank stocks, they were trading at big discounts relative to their current valuations. Having said that, there could be some bargains to be found, here. For example, I recently wrote how Wells Fargo could be a great buy for investors who have the patience to wait out the fallout from its recent scandals. Recent addition Synchrony Financial could also be a bargain for long-term investors. However, it's important to do your own research before investing in these, or any other, bank stocks in your own portfolio.